The leading independent specialist for windscreen replacement and windscreen repair based in Torquay and serving all of the Torquay area. National Windscreens Torquay fitting centre provides windscreen replacement and windscreen repair services to businesses and individuals throughout Torquay and the Torquay area. 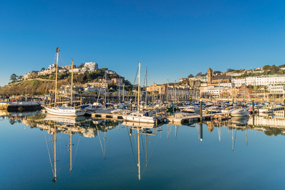 Torquay is situated in the county of Devon, and provides the perfect British sea side holiday. The award winning beaches and water sports such as scuba diving and waterskiing means there is not a shortage of new activities to be trying. The town can be accessed by the A379, A2022, A380 and the M5 is not too far north of the town if needed to reach the London and Bristol. The Torquay windscreen fitting centre and its mobile vehicle glass technicians service the needs of Torquay and the surrounding area including Newton Abbot, Dartmouth, Paignton and Totnes. With 108 fitting centres and over 800 mobile technicians, National Windscreens operates the UK's largest windscreen repair and windscreen replacement network. The company provides low cost, high quality windscreen replacement and windscreen repair from its Torquay fitting centre 24 hours a day, 7 days a week, 365 days a year. Repair and replacement of all types of vehicle glass including windscreens, rear windows and side windows is undertaken throughout Torquay and all of the Torquay area.